In a land beyond seven mountains, seven rivers, and seven hills, there arose the most beautiful town of the Czech lands. It was said that nowhere else on earth could one find so much beauty, and the word began to spread that it was a true jewel of a city. Visitors from all corners of the world came to admire it in awe, and each of them wanted to spend at least a night. But there were not enough houses, and so the local townsfolk began to give over their abodes to the people from the faraway lands. Each visitor thus spent a comfortable night in town, ate his fill at a local inn, or purchased some item for the long journey home. The news spread quickly across the world, and the number of visitors grew with each passing year. And so the local residents gave up the remaining homes in the center and built themselves simple houses on the outskirts of town. And it is to here that they moved the stores they needed for their daily lives (the pharmacy, the greengrocer, the drugstore…). The foreign visitors were not interested in such goods anyway. In their place, there sprang up stores with far more precious goods: gold, jewelry, precious gems, leather – so much beauty for the eyes to behold! The foreign visitors came from ever greater distances and there were more and more all the time. The streets filled with masses of people, who stood in large groups and admired every detail with great excitement. The town became impassable, and so the locals decided to give up the streets as well, and they no longer came into town at all. They translated everything into languages the tourists would understand and promised, should they ever venture into the old town, that they would try to be invisible. The foreigners were excited, and more and more came all the time. They took pictures everywhere – of themselves and each other. Everything looked perfect, until our hero came and ruined it all. 2. WELCOME TO ČESKÝ KRUMLOV! a town surrounded by nature – Hilly, green countryside perfect for hiking, biking, horseback riding, golfing, rafting and canoeing. The Lipno Dam and protected forests of Blanský les and the Šumava National Park are all within easy reach. K. K: “When I was going through some family photographs, I noticed that Krumlov looks the same from a distance. Only in the newer, digital photographs taken from up close can you see how dilapidated it was. Another thing in (nearly) all of them is that it looks like there have been hotels and restaurants as long as there has been a Krumlov. But I think they were different before. That’s why I’m sending the picture of us in front of the sign with the fried cheese. Also – and this is unimaginable today – they show empty streets. Not in March: We’re wearing light sweaters, so it’s during the season. This summer, I went to Český Krumlov on a family vacation. But what I saw in the city’s streets went far beyond what I could have imagined. The streets were full of tourists, who stood around on every corner and made it impossible to pass. Uninhabited buildings that acted as hotels, bed and breakfasts, or restaurants. Sterile streets, everything under absolute control of the locals, who had moved out of the center. I just stared at it all, trying to remember where I’d seen this image before. Everything was somehow familiar and yet completely upside-down. Every detail reminded me of something, but I couldn’t put my finger on it. I felt absurd – standing in a place that I couldn’t see. Then it final hit me: the Vietnamese-run convenience store on the corner, the negative attitude to the place, the locals’ unwillingness to visit the center, the lack of consideration, the impassable streets, the groups of people standing around, the question of safety and security, stores with goods that nobody needs, so many stores with jewelry, the mix of languages. This place is like the BRONX! An excluded locality! “Daylight robbery!” complained my mother when she saw the prices in one shop window. “Outrageous!” my husband exclaimed when our eight-year-old daughter wanted an overpriced ice cream. “How can anyone live here? !” my mother added in conclusion. At first glance, it may seem absurd to call downtown Český Krumlov an “excluded” locality. But if you ignore the city’s facade, the local relations are laid bare in all their force. And so I decided to approach the city as an excluded locality and to use the kind of strategy applied in similar places to change the current situation in Krumlov. To bring back normal life, visibly expressed on the city’s streets. To offer the kinds of JOB OPPORTUNITIES that are most needed in the particular locality. To support families thus employed by offering housing directly in the particular locality. From a detailed analysis of all three points, I realized that the kind of job that is most needed in downtown Krumlov is UNEMPLOYED PARENT or GRANDPARENT – the kind of work in which someone visible engages in normal life activities associated with family life on the city’s streets, and during which they spend time with their children. It is the kind of activity that makes a city a true city, and not just a backdrop for tourists. We are looking for: a positive attitude, reliability, practical experience. We offer: Flexible working hours, a pleasant working environment, and accommodations in the city center. Salary: Hourly wages and free housing. 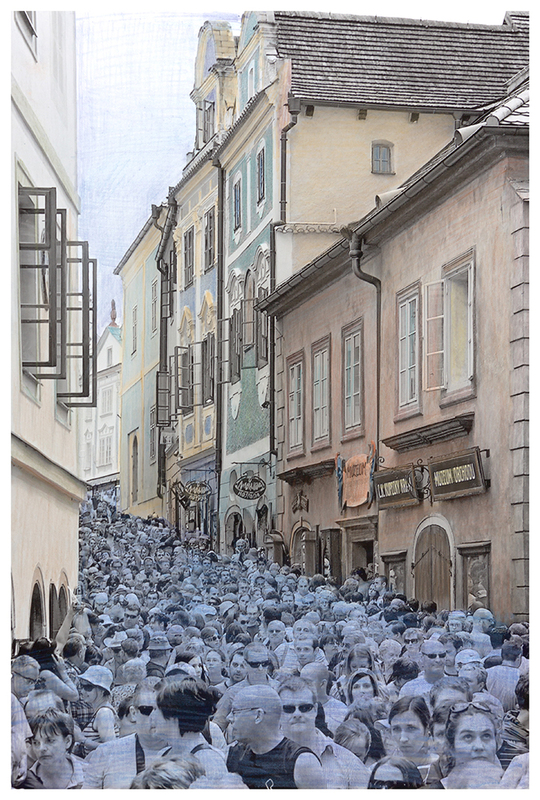 Although the project is being primarily realized on the streets of Český Krumlov, the main subject is much more universal, and is closely related to Venice and to the main theme of this year’s biennale: FREESPACE. Venice has been transformed into a backdrop for tourists just as much as Český Krumlov. Every year, the city is deluged by thousands of visitors from all over the world, and locals have begun to retreat – first into their homes, and then out of town. Venice has become an island of tourists. The local atmosphere has been replaced by a tourist atmosphere. Everywhere there are hotels and bed and breakfasts, the town feels exhausted and nearly impassable for locals during the high season. It is a problem faced by many places around the world, where people are beginning to talk about regulating the number of visitors or even charging admission to the historic city center. Selling tickets to a city sounds crazy, because in the end effect a ticket is what turns a city into a real open-air museum. My goal is to influence the streets “from the ground up” by introducing normal life – not “from the top down” by charging admission. The freespace is not on the streets; it is the place in our heads that allows us to act normally regardless of where we are. This at first glance banal definition is almost unrealizable in reality. We learn to follow thousands of rules and punish any transgressions. For me, the streets of Krumlov and Venice are prime examples of the loss of “freespace.” For this reason, I see the subject of FREESPACE in engaging in work that influences the city streets far more than any building. Like Venice, Český Krumlov is inscribed on the UNESCO World Heritage List. UNESCO – that magical word that attracts millions of visitors and brings much that is positive. At the same time, however, it turns the world’s most beautiful cities into dead museums of architecture. These towns and their inimitable local atmosphere lose the most vital part of their essence – normal life. How much tourism can a city endure and still remain true to itself? And what, exactly, is it that tourists hope to take home from these places? The project transforms the Czech and Slovak Pavilion in Venice into the headquarters of a new company called UNES-CO. It is a response to the situation found in cities inscribed on the UNESCO World Heritage List. UNES-CO introduces an original Czech revitalization system (the Czech Real Life System) that uses new job positions to bring normal life and normal activities into afflicted cities. In Venice, UNES-CO will present its activities using standard visuals inside and outside the building, promotional materials, and examples of real working tools. At the company’s reception desk, visitors will be able to browse through a catalogue of normal life activities or watch a live broadcast from Český Krumlov, where three selected families will be engaged in our pilot project for revitalizing the city’s streets. With these new employment opportunities, UNES-CO is responding to the changing face of contemporary society and offers an important shift in thinking: The exhibition’s curators hope that this fresh look at the issue will encourage visitors to the Biennale to engage in the project emotionally as well as intellectually, and thus come away with a more comprehensive understanding of architecture. Hana Jirmusová Lazarowitz is the co-founder and director of the non-profit Egon Schiele Art Centrum, located in several buildings belonging to the Renaissance-era former municipal brewery in Český Krumlov. Since 1992, Jirmusová Lazarowitz has overseen the revitalization of this Czech national cultural landmark (which, as part of the historic city center, is on the UNESCO World Heritage List), where she curates and organizes exhibitions of classic and contemporary art of the 20th and 21st centuries. The art center’s studios offer residencies for talented contemporary artists. The subject is in the air. And everyone has an opinion on it. Wherever you’re from, you know about it. You might just come into contact with it during your holiday, or you might live in it. The extent of it is evident in the graffiti appearing with growing frequency in the most popular tourist locations in the world: “Tourist: your luxury trip, my daily misery,” “This isn’t tourism, it’s an invasion!” “Tourist, you are the terrorist!” “Tourist, go home – You’re destroying our neighborhood!,” “Stop illegal hotels!,” “Tourist welcome – locals not welcome,” “Your selfies are raising our rents!” etc. She has an extraordinary gift for capturing the essence of a problem and the ability (including infinite patience) to come up with such non-standard solutions that sooner or later she convinces those concerned to cooperate to such a degree that they get involved and help to find a way and make things happen. She is not an artist who would invent and describe a problem, make public a challenge, and then wait for material to accumulate before she started creating something. Nor is she one of those artists who come up with a theoretical concept and then leave it to us to imagine what it would be like if it were to be realized. Kateřina Šedá prepares and carries out her projects with people and for people. She speaks with hundreds of people personally, goes door to door, visits schools and associations, talks with former and current town officials and wants to hear minority views. She knows how to listen. She tries to be absolutely impartial; she doesn’t want to fall in with or join any group. Seeks common denominators. And intuitively she selects potential approaches that lead to change. The centerpiece of Kateřina Šedá’s work is people, their relationships and their position in society, their relationships with the phenomena that surround them. She collects and processes information. She uses sociology, psychology, analysis … but at the same time she doesn’t abandon traditional artistic methods – she makes sketches and models, takes photographs. A fascinating aspect of her work is her absolute commitment to the phenomenon she is dealing with, whether it be the anonymity of housing projects, the raising fences between houses or the creation of obstacles among people – the dehumanization of everyday life. And then at some point, after long weeks and months of communicating with people in the field, she comes up with a solution: the establishment of “UNES-CO,” a fictitious company whose aim is to help “afflicted” cities like Venice, Český Krumlov, Barcelona and hundreds of others listed as UNESCO world cultural heritage sites to prevent normal life from dying out in homes and streets. The project, which Šedá began to conceive and prepare for the Egon Schiele Art Center in Český Krumlov, was later selected in a public competition organized by the National Gallery in Prague to represent the Czech Republic at the 16th International Architecture Exhibition in Venice. What a coincidence! The project is to be presented in a city that has been a UNESCO World Heritage Site for five years more than Český Krumlov and addresses the same, if not even bigger, problems. Kateřina Šedá presents her idea – rescuing cities overcrowded with tourists by “planting” normal people right at their touristic epicenters – with charming humor and hyperbole. Hundreds of people are mobilized for a period of three months to help bring life and activities that have just about disappeared back to the depopulated center of Český Krumlov. She decides to accommodate families with children and grandparents in age-old houses and provide them with employment, both full- and part-time. Though she doesn’t receive any fees herself, she pays them to act normally during their “working hours” (i.e., to carry out the activities that would be normal in inhabited town centers) – without, however, sidestepping tourists but, ideally, involving them in social events, games and sports, teaching them a few words in Czech, or inviting them to family gatherings. Kateřina Šedá’s project interrupts the flow of tourists streaming from one side of town to the other every day. Thus, though tourists might not “do” the entire center, they can take part in the life of the town, meeting local people not only to photograph them, but to be drawn into their activities. Many local people expect deliverance and help solving their problems. Many write her very touching letters. But many criticize her harshly and reproach her throwing money away (when there are holes in the sidewalks that need repairing!). Others tell her how she should go about things, who to talk to and who not to. They tell her who’s a jerk, who gets everything handed to them on a silver platter, etc. They forget that she’s gathering opinions and information on a particular topic – the issue of tourism and coexistence in historic city centers. Kateřina Šedá tries to listen to opinions, to read them and sort them, because they’re often repeated, and then she draws out what might at least in part address the problem in question. She herself says that as people begin to talk about the problem, there is often a shift in the way they perceive it and thereby an improvement in the conditions of both locals and tourists. And that’s what it’s all about! It’s not a fight against anyone but an effort to find out where the trouble is most acute and whether it might not be improved a little. Kateřina Šedá does not claim that she has the right or the ability to solve the problem. She’s not a politician; she doesn’t make decisions. She’s an artist who asks questions and lets those who are called upon search for paths to take. The messages to tourists on the walls of the world’s most beautiful cities are so terrifying that it’s no surprise artists have started dealing with them. The best among them manage to arouse both enthusiasm and indignation, agreement and resistance. And in Krumlov, Kateřina Šedá gets both in full measure! There are rumors, hate messages and criticism aimed at town hall and Šedá herself. But there are even more positive, often touching messages from people who want change and know that it will only come with great effort. Still, they want to give it a go. I remember how happy we were a few years ago when we started hearing Czech again in Český Krumlov. The reason then was the global financial and economic crisis. Today we might get the people we’re missing here without a crisis – people who will make do with the space necessary to sleep in a sleeping bag, who will want to wander through the center, meet up, talk to one another and to the tourists from exotic lands, too. The town might become much friendlier as a result! Most locals say that in recent years they’ve been avoiding tourists and that they only look them in the eyes when the tourists are paying them for something. There’s a great deal of exaggeration, as in Šedá paying volunteers who will hang around in a square and read by a fountain with five-crown coins. But it is through exaggeration that people have always been able to laugh, become interested or get upset and change things! It might work and it might not. But it’s worth trying. Another of Šedá’s projects comes to mind here – For Every Dog a Different Master. At the time, in an attempt to bring an anonymous housing project to life, she walked around the apartment blocks, wrote down the addresses and names on the buzzers, paired addresses from different ends of the housing project, and sent shirts sewn for the occasion from one the addresses she’d chosen to the other. You too might well have reacted quizzically to a shirt sent to you personally from some unknown person whose address was at the other end of the housing project! But thanks to this scheme, people ended up contacting one another. The fact that one pair even ended up getting married is almost corny. Another pair wanted to sue Šedá, so they took the corresponding steps together … And that was precisely what Šedá wanted. Those two people started doing something in cooperation; they’d found a reason for talking to each other in a completely anonymous housing project. Even in professional circles I run up against amazement that Šedá has actually – in practice – managed to carry out her project in Český Krumlov, that it’s not just the theoretical outline of a project, and that although she speaks of a fictitious company offering a special Czech system for bringing human warmth to the historical centers of protected heritage sites, it’s not just a hoax. Šedá really is employing people willing to live a normal life in the afflicted areas. And it isn’t just a matter of a few days. Šedá is testing and breathing life into her very human project for three months! Things don’t always change fundamentally. And if they do, not everyone is happy all the time. But many are led to have discussions, entertain ideas and make decisions. The goal isn’t to get implacable enemies to start talking to each together, but to succeed in bringing an even slight improvement to the situation both local people and tourists must face. The issue of architectural wonders listed as UNESCO World Heritage Sites and the massive outflow of original residents is a topic that politicians haven’t yet been able to deal with. It’s an issue being addressed by renowned auditing firms for big money, an issue the people of these cities are already ignoring or because of which they are even resorting to certain types of aggression towards tourists. At first glance, the project is funny; on the other, it’s absurd – definitely worthy of reproof and criticism. But if it weren’t presented with such contrasts and exaggeration, it wouldn’t have a chance in these soundbite times. Today, the general public is talking about it. Many people close their minds, but most often there is hope that locals can bring change together, that they can try to do what they want, to experience what they want in the center of their town once again. The power of the feedback – both positive and negative – in Český Krumlov is therefore a true confirmation of the timeliness, attractiveness and significance of this positively conceived project. Kateřina Šedá’s art is writing the history of everyday life in the words of normal people. Kateřina Šedá is bringing back humanity to society.